We hope you had a wonderful holiday! 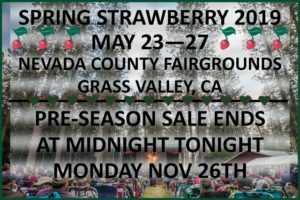 Not only is today our first day back in the office, but it’s also the last day to get your 4-Day camping tickets to Spring 2019 Strawberry, at the extended Pre-Season sale prices. You can buy your discounted tickets 24/7 online, by phone M-F, 9-5 at (209) 984-8630, or by mailing payment and the check order form to P.O. Box 664, Jamestown, CA 95327, on or by Monday, November 26th. Tomorrow, Monday, November 27th, is the first day of regular season sales which include the 2- and 3-Day camping tickets. RV sites with hook-ups will go on sale this Wednesday, November 28th at 9:00 am. For more information about how to get your reserved site for the Spring Festival, read our RV Site Reservation Guidelines. Get your 4-Day tickets now to the best little show on earth, at deeply discounted prices today, and your RV site on Wednesday. Questions? Comments? Give us a call! We’re here in the office M-F, 9-5 at (209) 984-8630 to answer questions, take orders, and reminisce about the old days. 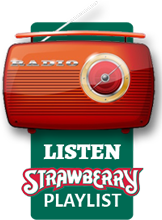 And we can’t wait to see you there, at the Spring 2019 Strawberry Music Festival!